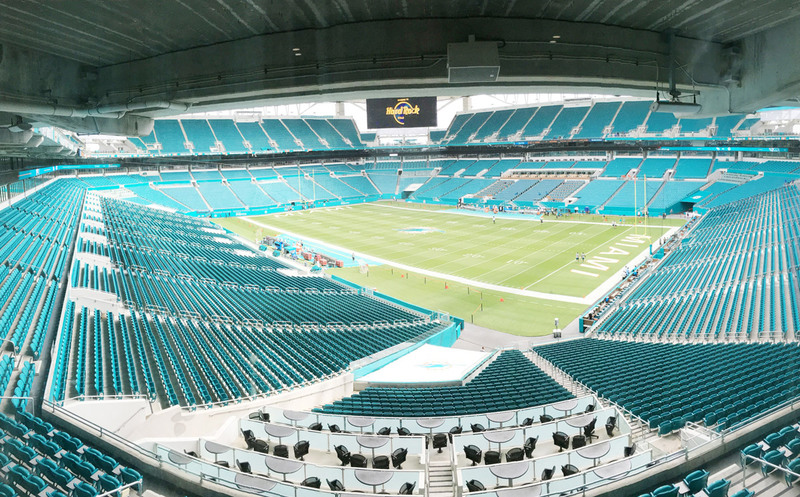 Hard Rock Stadium is owned by, and home to, the NFL Miami Dolphins. 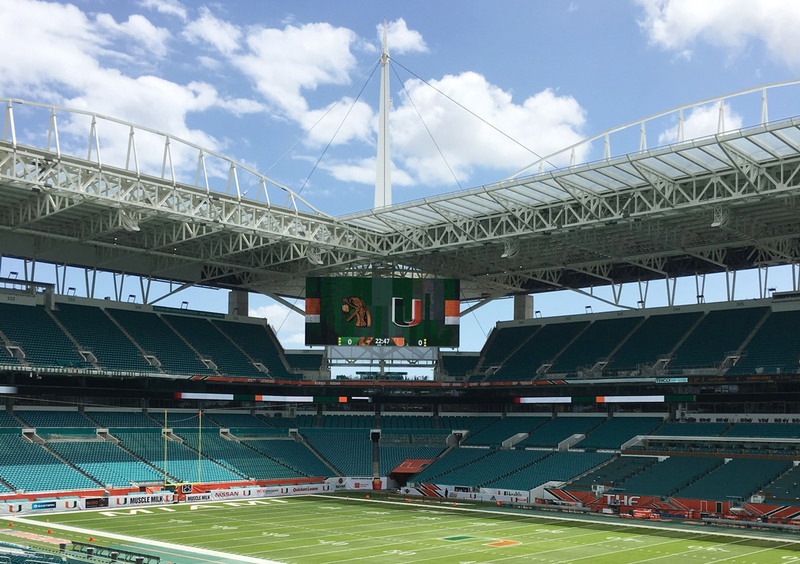 It also hosts University of Miami football and major entertainment events throughout the year. As part of a three-year, facility-wide renovation, the re-named facility now boasts a massively upgraded sound system by Electro-Voice. With the stadium’s addition of a roof and massive video displays, crowd noise levels are substantially higher than the original open-air design, making even coverage critical, both in terms of SPL and frequency response. In addition to the primary task of improving the fan experience through better audio, the sound system is also used for mass notification of life safety information. 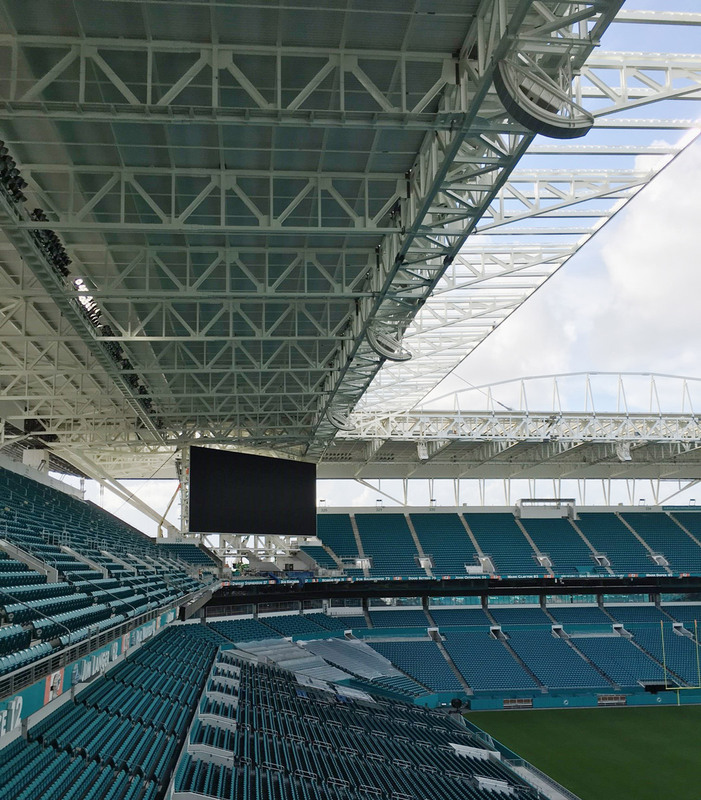 The Dolphins selected Diversified Systems to design and integrate the system, charging them with the task of overcoming increased levels due to roof reflections while delivering both vocal intelligibility and musical fidelity. Drawing from all parts of the diverse yet sonically matched Electro-Voice loudspeaker portfolio, the installation delivers concert-quality sound via 186 XLCi-127DVX line array elements, weatherized and integrated into custom-engineered frames to withstand extreme storm and wind conditions. These are augmented by EVF-1122S front-loaded loudspeakers and EVH-1152D long-throw loudspeakers to cover hard-to-reach zones like corner seating areas. In addition, 48 dual 18-inch subwoofers, custom designed for the project, add an exciting bass element that was absent in the stadium’s previous system. 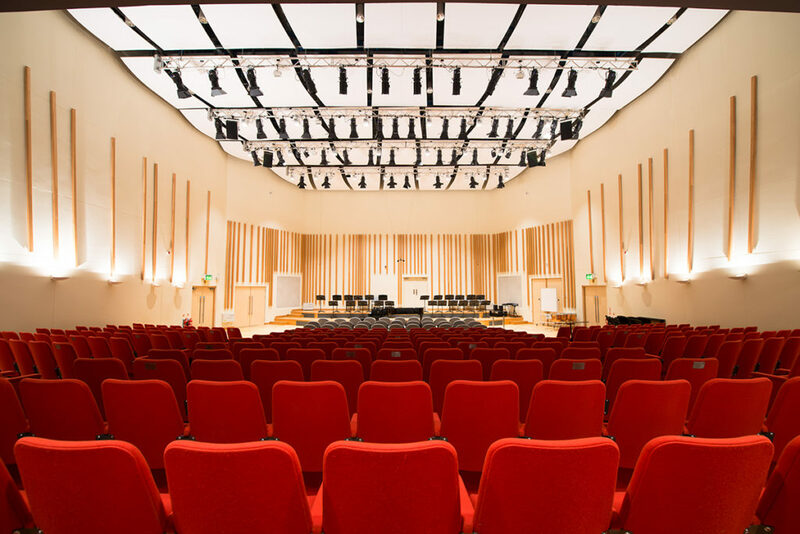 An ongoing installation challenge was the management of the installation across the renovation’s phased construction timeline, requiring ongoing support of the legacy sound system while the new Electro-Voice system was being installed, tuned, tested, and deployed. 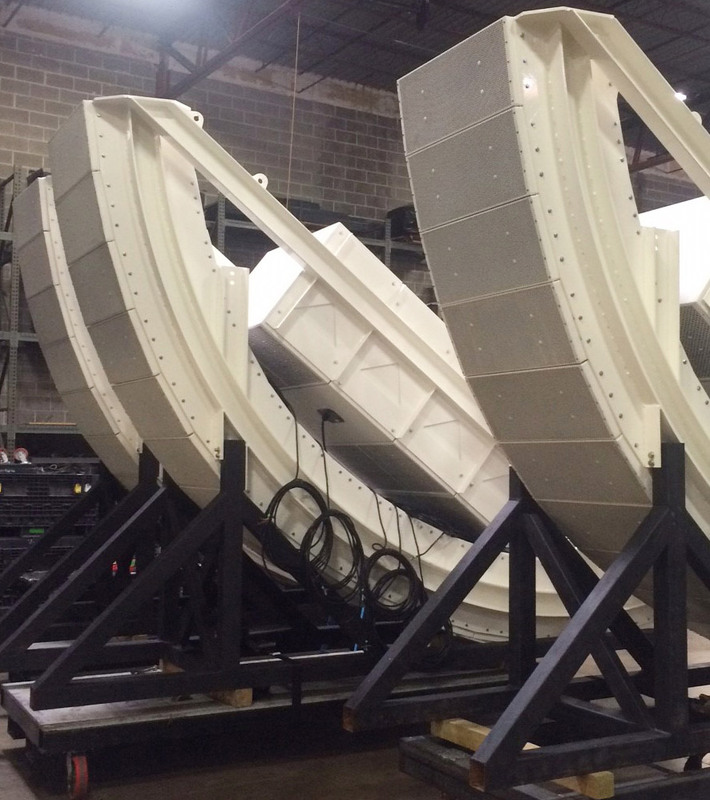 To ensure even coverage throughout all seating areas, EASE modeling and intelligibility plots were critical tools in selecting the appropriate loudspeakers and their placement. Two Electro-Voice NetMax N8000 digital matrix controllers allowed the integration team to apply FIR filtering to optimize loudspeakers as needed and appropriate. In addition to the primary task of improving the fan experience through better audio, the sound system is also used for mass notification of life safety information. 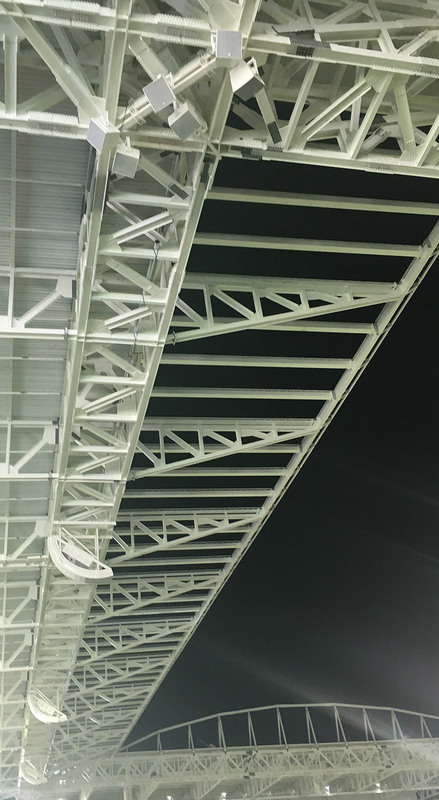 Electro-Voice ceiling and surface-mount loudspeakers ensure smooth, continuous coverage in luxury suites, concourses, restrooms, offices, and all public areas throughout the stadium. This task required approximately 1800 ZX1i indoor/outdoor loudspeakers and over 1000 EVID ceiling-mounted designs selected from EV’s wide range of options. The Dolphins team are pleased to report that the system has exceeded their performance expectations while meeting budget and timing requirements. The system is at its best when the stadium is full, enhancing the fan experience with clear, effortless coverage, and rising to the occasion to amplify crowd energy in big moments. 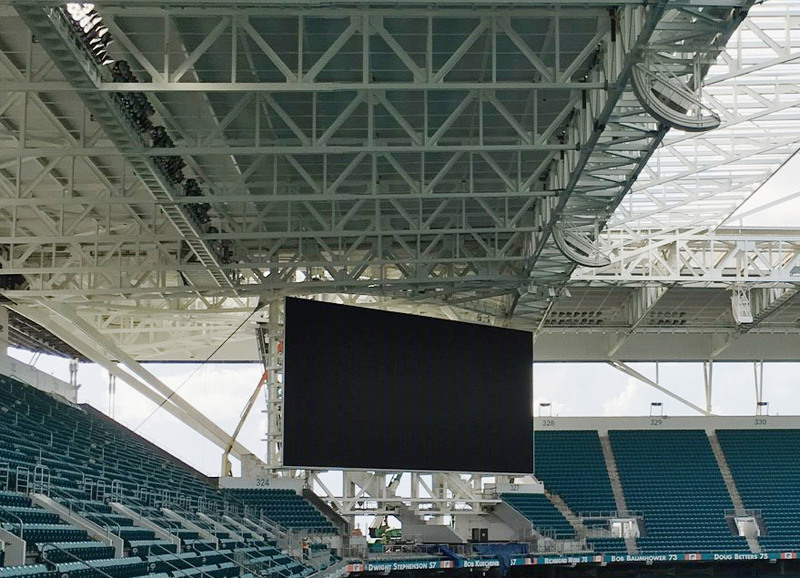 Whether deployed for sporting events or major concert events, Hard Rock Stadium offers a winning combination of full-range fidelity, comprehensive coverage, and high intelligibility that plays a key role in transforming the venue into global entertainment destination for large-scale events. Please contact us or Find an EV Dealer for more information on Electro-Voice products. ETC is kicking off a new era in upper stage machinery with the introduction of the P2 hoist. 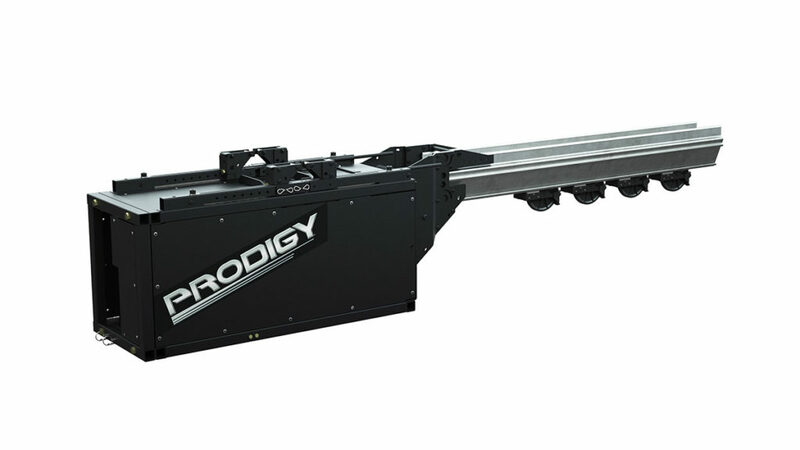 Offering quick installation, easy operation, revolutionary features and affordable system expansion, P2 – the newest hoist in ETC’s Prodigy® family – can go where other rigging systems can’t. The compact, 130-kilogram* P2 fixed-speed hoist has a 300-kilogram load capacity and can be used as a complete system by itself, or it can be combined with larger hoists in a hybrid system. 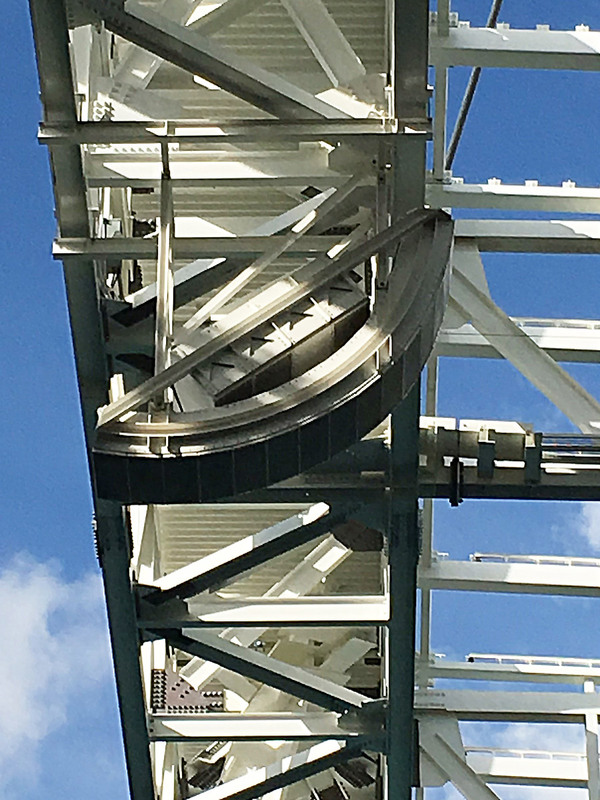 Using five millimetre lift wire rope, it offers 15 metres of travel with up to eight lift lines. ETC’s QuickTouch® and Foundation® families of rigging controllers are feature rich, yet intuitive and uncomplicated, and work seamlessly with P2, and all of the hoist solutions from ETC Rigging. The revolutionary features and capabilities that set ETC’s rigging products apart from others are at work in P2. The P2 hoist can be installed with or without ETC’s unique compression tube, is engineered to fit into the smallest spaces without adding lateral loads to buildings, so venues that aren’t able to use other larger hoists will finally be able to access automated rigging. Additionally, loft blocks can be positioned independent of the building’s structural mounting points, and allows users to support the attached load in a manner best fitting the load, instead of the building. Safety is at the heart of P2, which includes load cell, and slack line detection. It also has a self-locking worm-gear system to prevent accidents. P2’s control electronics are built into the hoist, and incorporate hard-wired deadman and E-stop circuits. For more information about P2 and all ETC Rigging systems, visit www.etcconnect.com. Find an ETC Dealer or contact us for more information on ETC products. The comprehensive solution, specified following extensive demonstrations between Stage Electrics and the University, includes an Ion® console with two fader wings; a Unison Paradigm® power control system; Sensor® dimmers with ThruPower modules; and an array of ColorSource® PAR, Source Four® LED Series 2 Lustr® and Daylight HD fixtures and a comprehensive state-of-the-art house lighting system from GDS. ApexPro would like to officially welcome David Butcher to the team. David joined as of the first of March. He is the newly appointed Technical Support Manager. With more than 10 years’ experience in AV Design, Software Conceptual Design, Sound Design, Hardware Interfacing and Generic and Automated Lighting, David is an institution in the local industry. 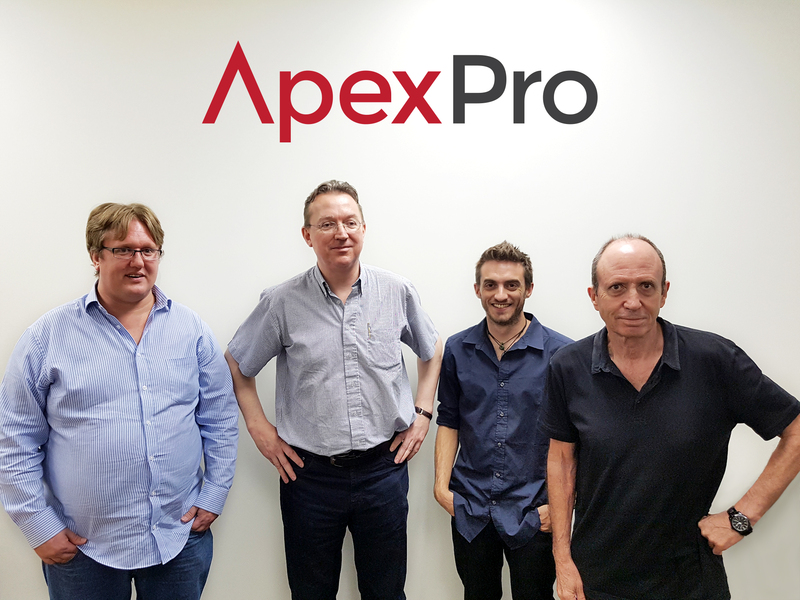 His addition is a major boost to ApexPro’s capabilities. Welcome David! Pictured left to right are: David Butcher, Jeremy Roberts (Associate Regional Manager, ETC Ltd), Mathew Lewis (ETC Product Specialist) and Ian Blair (GM Lighting and Structures). 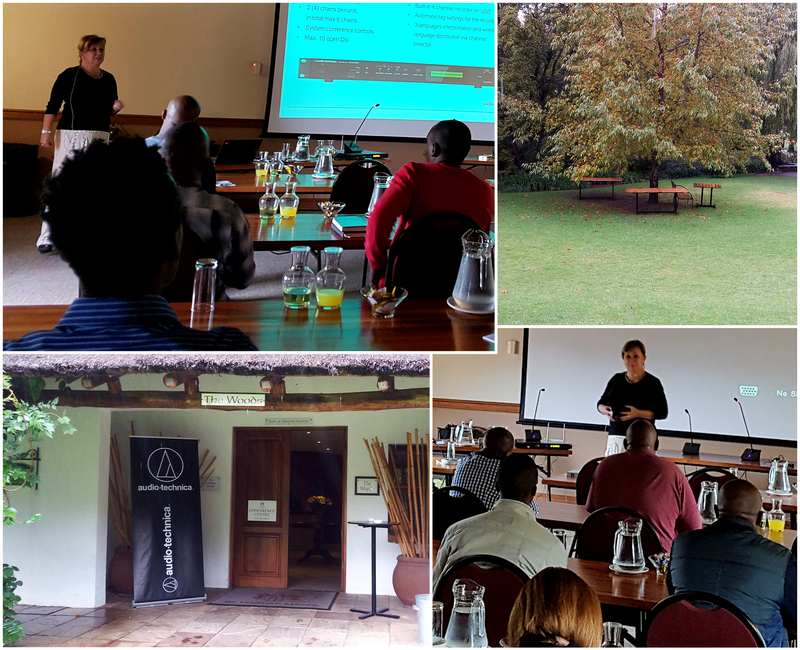 With unmatched levels of practical experience and expertise and the right combination of the very best people in their respective fields, ApexPro is poised to make a huge success of 2017. 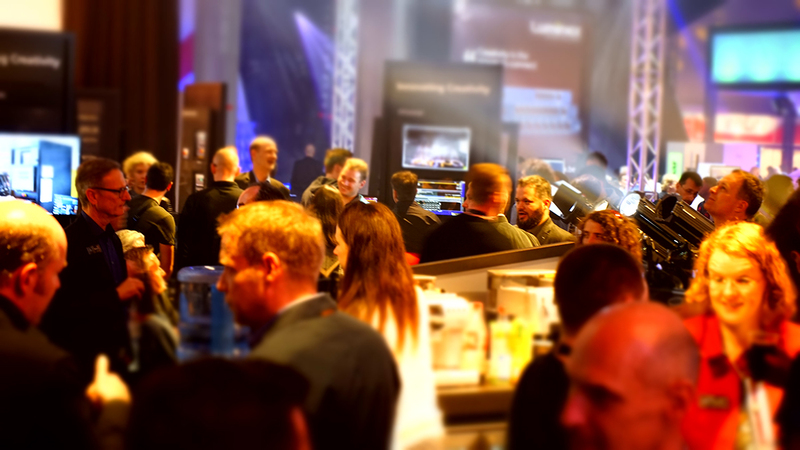 Germany – ETC is powering up to demonstrate a selection of its latest and most popular lighting and rigging solutions at this year’s Prolight+Sound, taking place in Frankfurt from 4–7 April. ETC representatives from around the globe will be available to answer your questions regarding lighting control, luminaires, rigging and complete system solutions, in hall 3.0 on stands E47, E51 and F51. Visit stand E51 to see the recently launched Gio @5 console. This lighting desk brings the acclaimed, professional-grade control of the Eos Ti® and Gio® consoles within reach of users with tighter spaces – and tighter budgets. Receive a demo using the Gio @5, another Eos-family console, or Cobalt Wings, and see in action a selection of ETC’s Source Four® LED Series 2 luminaires. The Lustr® array, with its x7 Color System, provides the brightest light in the colours you use most, and the Daylight HD and Tungsten HD can be tweaked to perfectly illuminate individual skin tones. Additionally, you can see the Irideon FPZ, a fixture that pairs the best of the Source Four Mini LED platform with exceptional output and a sleek industrial design to light spaces with elegance and subtlety. On stand E47, product specialists will show you all the features of the entire ColorSource family of products. 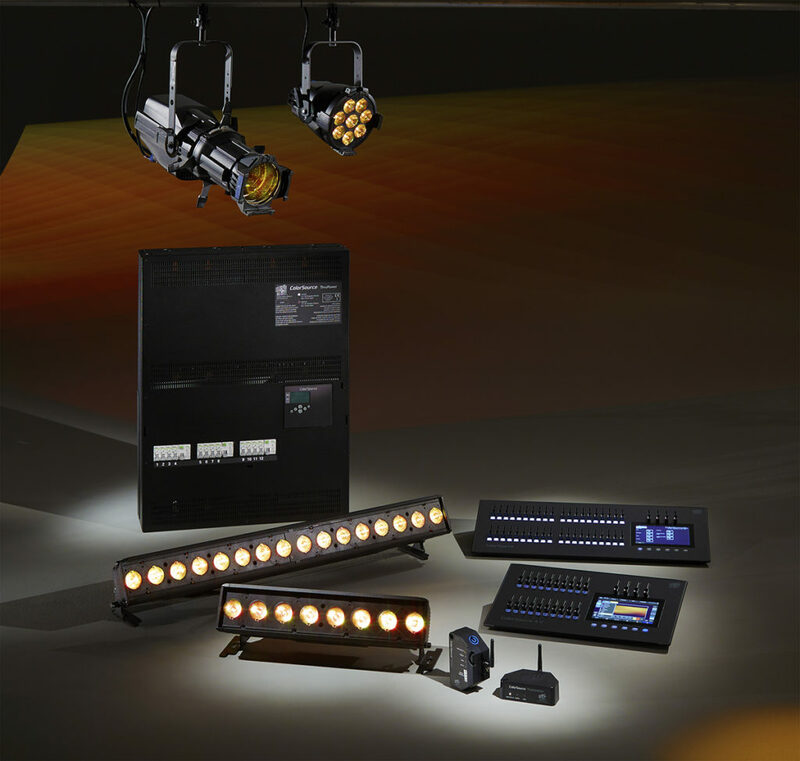 Developed for those with limited budgets who want a complete, high-quality LED lighting system with plug-and-play setup, the family includes ColorSource and ColorSource AV consoles, ColorSource® Spot, PAR and Linear fixtures, and ColorSource Relay and ThruPower power control solutions. Talk to the experts on stand F51 about ETC’s selection of cost-effective rigging solutions, designed with halls and smaller stages in mind. Explore the features of QuickTouch® and Foundation controls, and the latest Prodigy P2 hoist, which expands the possibilities of upper stage machinery systems. This is also where you can find the latest innovations in Unison Echo® and Paradigm® architectural control solutions, and the new Sensor3 TPSR app, programmed to enable you to identify and change the mode a circuit is set to ­– all from within the app. Also on stand F51, don’t miss special guest Birgit Mörtl, a multiple world champion in bodypainting, who will be demonstrating the artistic connection between body, colour and light, every day of the show. ETC will host one of its internationally acclaimed Student Sessions, on Tuesday 4 April at 5pm, in Forum Level C, Raum Substanz. The always-energetic event gives students an exclusive look into ETC’s unique culture, service philosophy, and product development, with the opportunity to ask questions, learn about employment opportunities and win swag. To attend the Student Session, pick up a ‘VIP pass’ at ETC’s registration desk on stand E51 during show hours. For further information about ETC at Prolight+Sound 2017, visit etcconnect.com/About/Events/Tradeshows/Prolight2017/. The recently opened Banff Gondola Terminal represents quite literally a high point in lighting installations for ETC. Perched on a mountain peak with an elevation of 2,281 metres (7,486 feet), the four-storey structure gives visitors access to restaurants, bars, retail stores and stunning views of the Rocky Mountains. Brewster Travel Canada, working with a team of subcontractors, completed the 3,251 square metre (35,000 sq ft), $26 million reconstruction in 12 months. 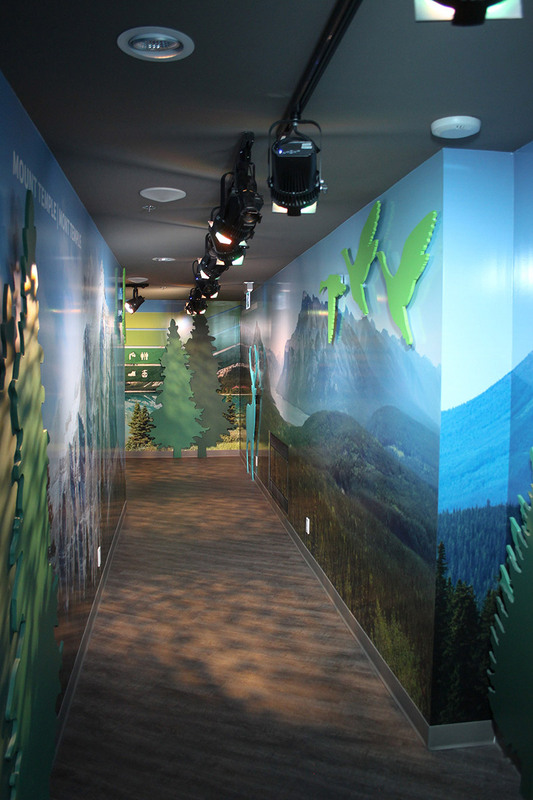 Video screens, reading panels and three-dimensional displays depict information of the park’s iconic flora and fauna, designed specifically to thrill and entertain the roughly 600,000 visitors who take the gondola annually, says Dave McKenna, president of Brewster Travel Canada. With no access road, all the equipment had to make the eight-minute gondola ride to the oxygen-scarce heights, and – as opening day approached – the gondolas were running 24/7 to meet deadlines. Many of the bulkier pieces of gear had to be delivered by helicopter or in a specially enlarged gondola that could only be used outside of public opening times. Pyatt’s previous experiences with GES, on their very successful touring exhibitions (Harry Potter and the soon-to-be-launched Avatar) were very much at sea level. He hired lighting designer Josh Starr whose background was exclusively in New York theatre and live events. 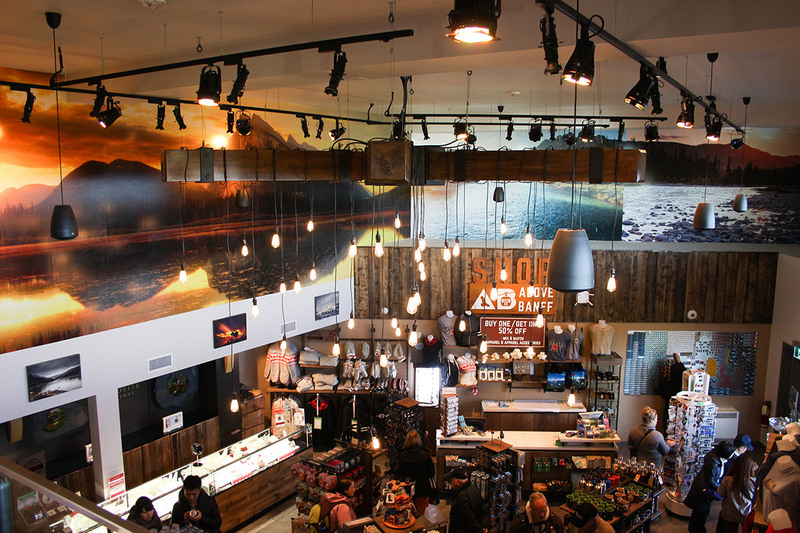 “They wanted a theatrical twist on a permanent install, and I jumped at the opportunity,” says Starr. With approximately 150 D22 LED luminaire packs, 100 Source Four Minis and 150 GDS ArcSystem Pro One-Cell fixtures, the Unison Paradigm®-controlled system has an amazingly small, three-phase, 25-amp power requirement. ETC service technician Tyler Martin, who worked through Field Service CA, explains: “The whole building is automated for convenience using Paradigm control and the astronomical time clock feature.” At 7am as the sun is rising over the Rockies, the lighting system executes its early-morning look and at the end of the day, as the guests dine in the fading light, another cue dims fixtures that reflect on the glass surfaces to create an unimpaired view of the scenery. Starr makes full use of the colour palettes in the Paradigm controller to “make the images pop.” Foliage breakups in the Source Four Minis add to the displays depicting Canada’s natural majesty. Unison racks drive the Source Four Minis, sconce lights, relay switches, and house, emergency and décor lighting. In another ‘first’ in this remarkable installation, a GDS ArcSystem is running wirelessly at 2,500m (8,200 ft) above sea level. 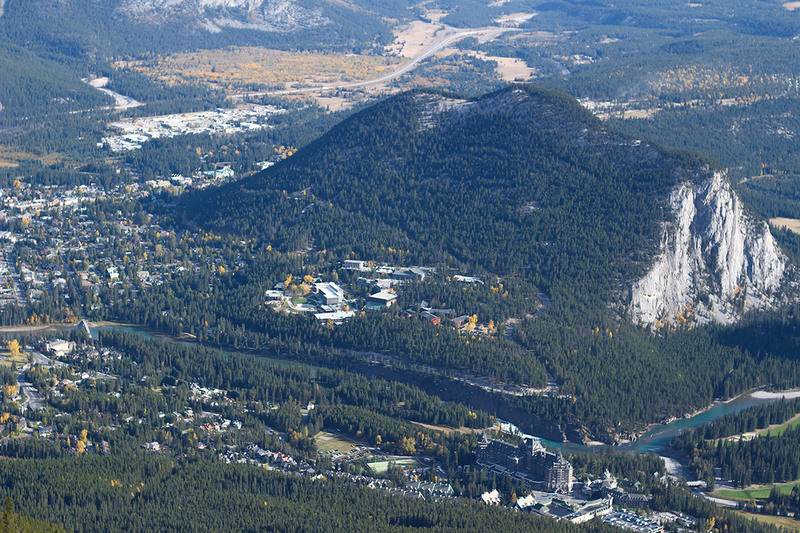 Despite its tiny power requirement, the building is well-prepared for future expansion as it gains popularity as one of Canada’s premier tourist destinations. The lighting tracks are powered but not fully populated, and each floor has extra nodes and push-button stations to allow for additional fixtures. “We are using about 1,500 channels of control, but have the mains power and control capability to add more universes in the future,” adds Tyler. Despite “challenges associated with a project being on top of a mountain,” Michael Pyatt and the entire design team are more than ready to take a deep breath and move onwards, if not upwards. Written by Marshall Bissett. Photos courtesy of Tyler Martin. ETC products are available from any of our authorized ETC Dealers.